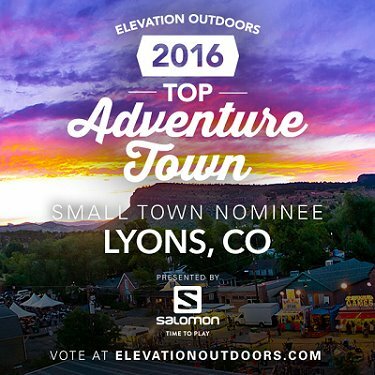 Vote for Lyons in the Final Round! Last weekend to vote! The final round ends Monday, Sept. 19 at 9 a.m. The Town of Lyons is looking for local residents to participate in a survey regarding Short-Term Vacation Rentals (STVRs) in Lyons. With the significant increase of both hosting and booking through AirBnB, VRBO, etc., as a means for short-term lodging in Lyons, the Town’s Planning & Community Development Commission is looking to recommend some changes to the Town’s current code that would make STVR legal (a “use-by-right”). Currently, this type of short-term lodging is not allowed in Residential zoning districts without a business license for a Bed & Breakfast. The Town would like to create some rules to protect the character of the neighborhoods in Lyons while also allowing Short-Term Vacation Rentals (STVRs), as a means for additional income for Lyons residents and an opportunity for more visitors to stay in this lovely town. In an effort to understand the various sides to this issue, the Town is looking for input. Please take a moment to fill out this short, 10-question survey to weigh in on this hot topic. Though log-in information is required, all survey submissions will be anonymous. Do you currently rent your property on AirBnB or VRBO? Would like to share your experience with us? Are you concerned about the impact of STVRs? Would you like to share your perspective with the Town? If so, please contact Matt Manley, Flood Recovery Planner (mmanley@townoflyons.com) to sign up for 1 of 8 spots in the Focus Group. Depending on the number of respondents, multiple focus group sessions may be held and/or participants will be randomly selected to participate.